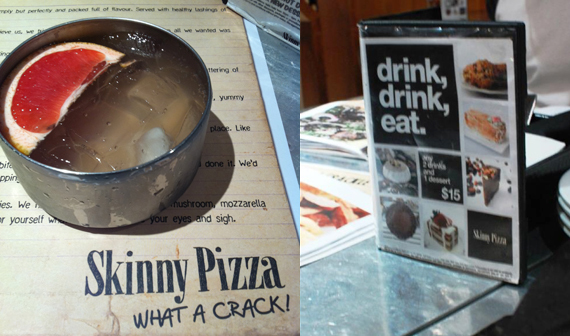 Decided to try Skinny Pizza at Raffles City shopping mall when I met up with my friends who used to interned with me at a media production (mad)house. We were quite enthusiastic when we ordered The Famous Tiffin Punch, but it wasn’t as great as we thought it would be. The only thing special about the $60 bombay sapphire gin, lychee liquer, pressed grapefruit, ginger and Mumm champage mix was that it was served in a tiffin carrier. Beyond that it tasted pretty much like an average cocktail. The pizzas were quite delightful though. 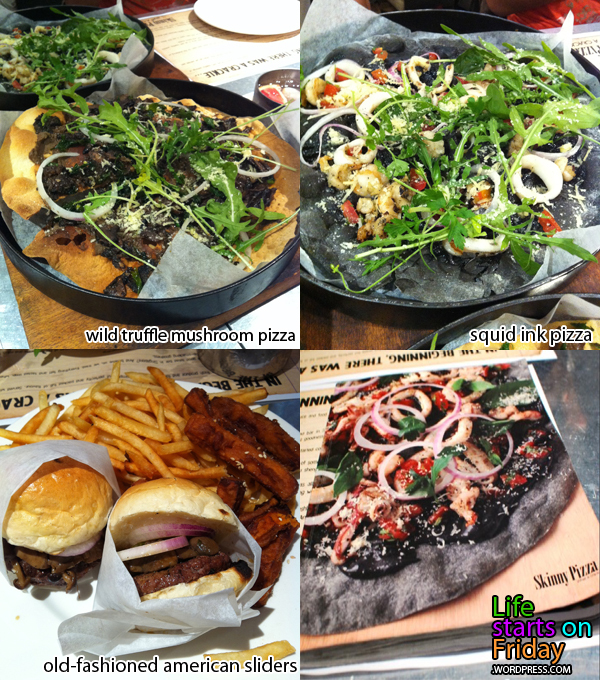 The wild mushroom truffle pizza and squid ink pizza had their unique taste on the crispy crust, but the portions were too small. A meal just isn’t satisfying when it doesn’t fill up our stomach. Y’know I am quite puzzled why the waitress told us that it is 1.5 person portion per pizza. Now for my dish, I ordered the old-fashion american sliders because I knew the pizzas weren’t going to be enough for me. I know I shouldn’t expect much out of them because it is a pizza place but I was pretty unhappy with the sliders. Did I make all the wrong food choices that day that they turn out to be at their worst state? 1) The well done beef was too dry, tough and plain. This entry was posted in Food, Weekend belly treats and tagged burgers, cocktail, drink, food, photography, pizza, sliders by lifestartsonfriday. Bookmark the permalink.